Each hair stroke adds dimension and shape to the brow for a more voluminous natural look. Microblading is a form of semi-permanent tattooing for the brows. Our very talented technician will map out your brow bone, paying careful attention to the symmetry of your face and your desired thickness. Together you will choose a color that best matches your hair or best gives you the desired effect you are looking for. Then, using a small tool with nine tiny blades and the ink she will apply gentle hair strokes to the area building a new fuller brow. Each hair stroke adds dimension and shape to the brow for a full natural look. What’s one of the best parts about microblade brows? Why that’s easy, it’s the time saved every day not having to draw them on anymore. Fill after one year from initial set subject to the technician’s discretion and dependant on the state of the brow strokes. If it has been more than a year, please book a consultation appointment first. Please note, first arrangements are treated as a full set even if the brow has been tattooed before another technician or clinic. New brows are a two-part process. In order to ensure the best new set of brows, allow for two hours of your time so that our specialist can properly map out the area and together you can both build the beautiful new brows best suited for the structure of your face. The second part is your touch up appointment (4 to 6 weeks later) and may only take an hour or less. Your new brows will need some maintenance, as they do fade and shrink over time. Typically most people get them touched up once a year. The procedure is not pain free although our specialist can put some numbing cream on prior to starting which will help. The healing process can take up to 4 weeks but typically the bulk of the healing is done in the first two. It is important to note that throughout the first week or so of the healing process your eyebrows will appear very dark, much darker than they will look when they are healed. This is because the ink is pushing to the surface and is scabbing over where the hair strokes are. Once the scabs fall off the eyebrows will appear much lighter. During this process it is important not to scrub the brows or pick off the scabs. Be sure to pay careful attention to the aftercare procedure that the specialist will go over with you once you compete your new set of brows. The Naked Truth is now offering, in addition to Microblading, permanent makeup solutions. Eyeliner – Now you can have perfect liner all day long and well into the night. Perhaps just a lash line enhancement to add that extra pop against your lashes, or maybe a dramatic cat eye, either way there are customized solutions waiting for you. Together with your specialist you will both decide on the best solution. Powder Brows – Microbladed brows have been the trend of the last few years, but for those looking to have a more solid look, and are tired of filling in even their microbladed brows perhaps a machine is the best route for you. Together with your permanent makeup specialist you will decide on shape, size and colour for the best-looking brow. Gone are the days of brows that look tattooed, and in are the days of better colours, shape and dimension. Combination Brows – Not ready for the bold permanent look of the powder brow? Perhaps a combination of natural looking hair strokes with shading is the right move for you. This is the best way to a natural looking “done” brow. You will truly be “done” and ready for any event or adventure coming your way. Lips Lips Lips – Remember the permanent liner of the 90’s? Times have changed and so has the permanent make up world. Now you can blush the entire lip and be done with having to re-apply lipstick or gloss all day long. The best part of the lip blush is the ability to enhance the overall shape and appearance of size without using dermal fillers (although don’t get us wrong… we still love our dermal enhancements here at The Truth) Now for those that are interested in just enhancing the contour that option is available too. Fill after one year (combination brows) or after two years (Powdered Brows) from initial set subject to the technician’s discretion and dependant on the state of the bros. If it has been more than the aforementioned time, please book a consultation appointment first. 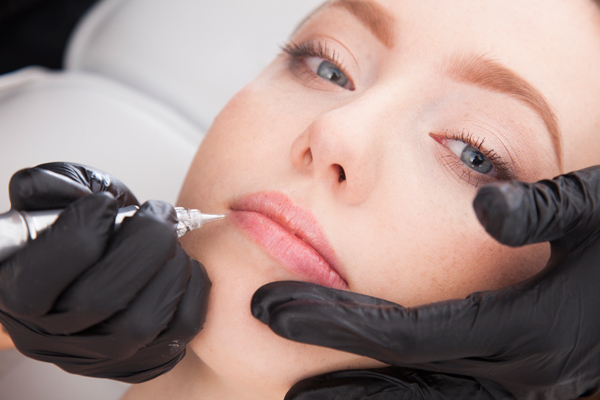 Please note, first sittings with the technician are treated as a full set even if the brow has been tattooed before another technician or clinic. It is not without some pain or discomfort but we do use a numbing agent to keep you as comfortable as possible. Yes it is permanent, although after time and exposure to the elements it will fade and lose its vibrancy so it isn’t unheard of to get it done again to restore that crisp fresh look. How many applications does it take? Often it takes only one for permanent makeup but it will take two sessions to build the perfect microbladed brow. 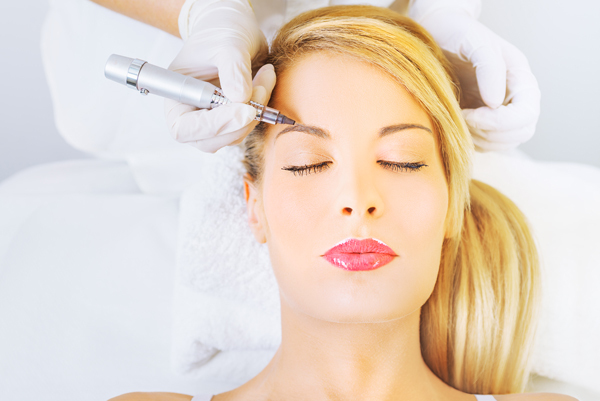 With Permanent make up we schedule you in for a follow up 6 to 8 weeks after your initial session to see if you need a touch up. Is there a charge for the touch up? If a touch up is needed after the first session then it is on the house! We say your procedure isn’t complete until we see how you healed and whether or not you need any final touches. I had microblading done with Kim, she is amazing and so professional. I absolutely love my eyebrows!! I would highlight recommend Kim! Saw Kim today for a microblading eyebrow refresher. Love her technique and attention to detail. Such a gorgeous space and love Kim and her staff to pieces! Highly recommend! Such a fun space! Kim was very knowledgeable, helpful and made me feel right at home. Highly recommend!